All spoke openly about the high and low points, revealing information that has not been made public before this. In fact, we have so much material, that this has become a three part article - pre-Worlds, the Worlds and post-Worlds. This is part one. In 2000, the UCI announced that Hamilton had been awarded the 2003 Worlds. It had been a long and convoluted road to get there. An original bid had been made for the 2001 Worlds by Giuseppe Ferrara and Giancarlo Serrafero, which went to Lisbon instead - not a bad thing, given the events of September 11th that year. The North American location was a gamble for the UCI; the core European nations had bidding cities every year, and the vast majority of cycling sponsorship and television revenue came from Europe. "It was at the world championships in Plouay (France) in 2000 that we got the Worlds from the UCI," recalls Pierre Hutsebaut. "I remember that Brian Jolly signed [the contract] with Hein Verbruggen in Plouay. Then after that I was assigned to make it possible on the technical side." "A lot of things come to my mind. The first thing was 'My God, how can I do this!' [laughs]. Because I had been to more than 20 world championships, but never on the organizational side, always on the participation side. So I started to take notes right away." Brian Jolly points out "I think it was a big day that Canada brought the Worlds to Canada and put on a first class world championships for the UCI. It was really a gamble for them to move out of Europe, and part of the process that helped us get the event was that after the original bid, which we failed on, that they made the decision to go out of Europe every seven years. Basically, if things turned out right, we got the first crack at it. It established a process for the Worlds to go out of Europe. I remember one of the fears was: 'Boy, it's too late in the year for you guys, you're going to have snow'." Initially, it was two transplanted Canadian-Italian cycling enthusiasts that got the bidding process underway. Giuseppe Ferrara was a former bike racer, bike shop owner and engineer who worked with Jim Miele to design his factory and bike line (for those new to cycling, Miele was a popular Canadian bike brand in the 1980s and 1990s). Giancarlo Serrafero owned North American Bici, an importer of many top Italian cycling brands. Ferrara also got the support of Hamilton MP Sheila Copps, the Heritage Minister (which oversaw sports), and a huge supporter of her city. Copps made a massive commitment of $10 million by the federal government to support the project. This seemed to all but guarantee the success of the event - it was more than the total budget for some European-based world championships. When the province came on with $5 million, and the City with more than $2 million (mostly in services), the Hamilton Worlds appeared to be awash with cash. "So, my first memories are a lot of issues, a lot of difficulties ... for at least one year it was very, very difficult. I remember that because of lack of money I was working in [Board of Directors Chairman] David Braley's office, right in his office because we could not have a contract, nobody could be hired, nothing could be signed," recalls Hutsebaut. Brian Jolly says that there were even earlier problems, that almost lost Canada the championships: "The biggest difficulty of all was [Ferrara and Serrafero]. They were a nightmare for us. We supported them for the bid, and I give full credit to them for the first bid, when we failed. And we failed because there wasn't enough work put into it." "To be honest, we didn't know that there was a deal, probably made beforehand, with Lisbon. That's what opened the door for us. I criticized Verbruggen [UCI President] strongly, I said,'You know, you can't do this; we had the strongest bid, and yet you gave it to Lisbon'. And I know why - there were deals. That gave us an opportunity to present our case, that we were treated unfairly, and it helped to move on to the next one." "I was there at the inception with these guys [Ferrara and Serrafero], and we met with the government at very high levels. One of the things I insisted on was that we have a $2 million legacy of cash from the event, something that we could feed back into the system of our sport. I was tired of dealing with events of that magnitude, that once it was gone, it was gone. So we made that arrangement, the governments were on board, but what that did to Giuseppe and company - they didn't realize at the time - they were trying to run this event to make [a] profit ... Well, you can't have government funding and make a profit. So we had an issue - they were awarded the event conditionally." "None of this was exposed at the time, and Giuseppe and Giancarlo took credit for something they didn't do; they had the concept, which was great, but they didn't put on the event and had very little to do with it. It was difficult to keep a lid on it at the time, we were taking a backseat to what they had supposedly done. And they did nothing, in effect. So, we had to figure a way into how we could work this out." "Those were something of things going on behind the scenes that nobody knew about. Giuseppe and company were still taking credit all the way up. We made them honourary vice-presidents, which kept their credibility in the community." It also led to a lawsuit, which has still not been settled, ten years later, with Ferrara demanding payment for funds he claimed they had put into getting the Worlds, and that were supposed to be reimbursed. Brian Jolly says that the settlement is now, after a decade, weeks away from being signed. "So they got the event, conditionally," continues Jolly. "Six months after they were awarded the event, they hadn't fulfilled any of the conditions. The UCI called me and said 'Look Brian, we need you to pull this together on behalf of Canada - you and the CCA - otherwise we are pulling the plug and going back to Europe'." "We had high level meetings with the government and got them to support us; at the time it was Sheila Copps. She worked with us and there was communication between her and Hein Verbruggen and we were able to get all the ducks in a row, and we were able to confirm that we were going to be able to put the event on with all the conditions." The conditions were, first and foremost, financial security and TV broadcast capability. I can say that after the commitment by Sheila Copps (which I was told privately by UCI people impressed the hell out of them that a federal minister would make that sort of commitment), the fact that CBC signed on to produce the television feed really sealed the deal. Earlier in the process, when UCI technical staff were visiting potential sites, I had a chance to talk with a member of the UCI staff, who said that TV was critical - it is an enormous source of revenue for the UCI at this, their biggest owned event. She also relayed the story of Colombia in 1994 - the previous location outside of Europe to receive the Road Worlds. The UCI had taken the organizer at their word when they said that a satellite feed to Europe for the races was all arranged. To their (UCI's) horror, they found out late in the process that 'nothing' (her words) had been set up, and the UCI was forced, at enormous expense, to air freight in an entire Dutch production team and studio equipment. She said "We will never allow that to happen again". "The difficulty started with the financing," explained Hutsebaut, "because it was the period where the federal government was the Liberal party and the provincial government was the Conservative party. So there was a game of power between the two governments, and it became a waiting game to get the money. Without money we could not start to hire people, to sign contracts ... all these things." "When we went to Zolder [Belgium - 2002 Worlds] to make a presentation, we had to do a kind of fake - everybody was wearing a world championship shirt, but actually it was Sport Canada people, it was friends, because nobody was on board, there were no staff. At that time we were not 100% confident that we could put it together in one year's time." There were other problems - the 9/11 attacks and subsequent security demands, and the SARS epidemic in Toronto in the spring of 2003. "My first impression was that it was a difficult start," agrees Hutsebaut. "The day of the [official] announcement was September 11, 2001. One hour before the press conference, the airplanes crashed into the Twin Towers at the World Trade Centre. So, it was a bad start for the world championships. It's kind of a miracle that we succeeded." I remember vividly the 9/11 events Pierre Hutsebaut was describing, because I was caught in the middle of it. 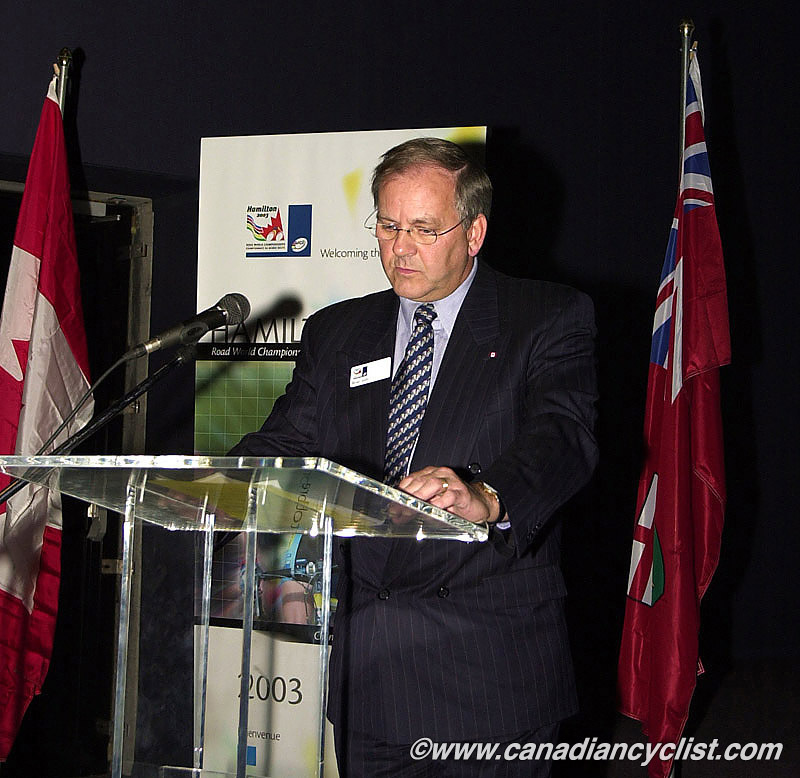 I was heading to Vail, Colorado, for the Mountain Bike Worlds that morning, and my partner, Tracy, was heading to Hamilton after dropping me off at the airport in Toronto, to cover the official announcement, where Sheila Copps and Hein Verbruggen were the key speakers. "With the [terrorism] situation, with the delayed money, then the SARS epidemic ... there was a warning from the World Health Organization not to travel to Toronto, and all the bookings were cancelled. 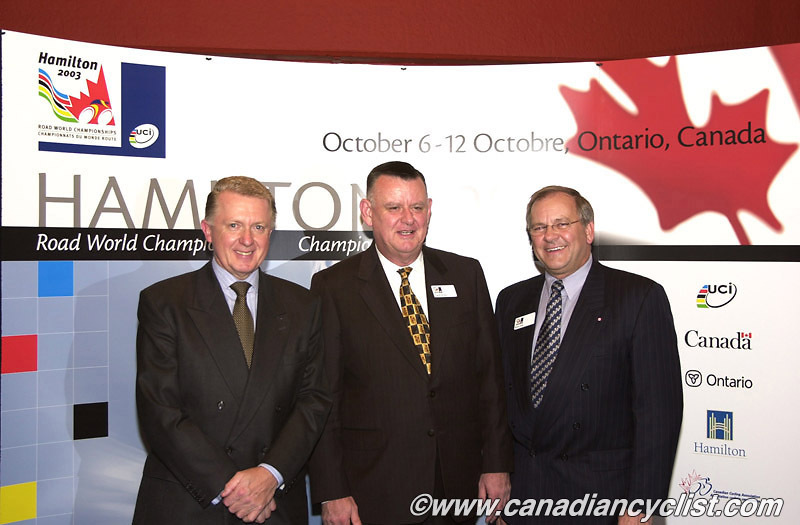 The word in the international cycling community was that the world championships would not be in Hamilton. I remember clearly that it was a kind of attitude in Lisbon in 2001 and then during the 2001-2002 years: 'Oh no, it will not be in Canada, some country in Europe will take over at the last moment'." However, the Worlds organization struggled on, eventually accessing funds, when a more conciliatory effort was made by provincial minister Frank Klees. Staff were hired (and some fired), and the Worlds began to take shape. There was still scrambling in some areas - for example, branded clothing didn't show up until the last moment - but all the major areas were covered. They had improved from a B- overall (with some failing grades) to a B in our estimation, two weeks out. Now, it was time to see how Hamilton could actually pull off the Worlds. 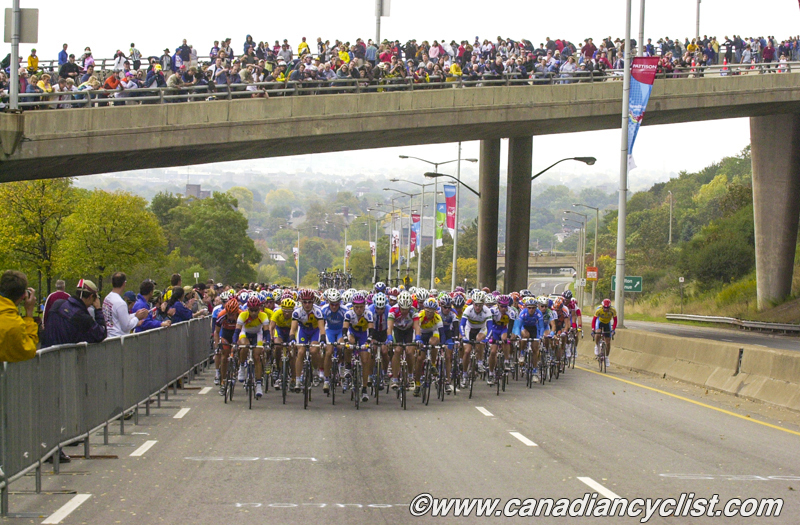 Do you have memories of the 2003 Road Worlds in Hamilton? Share them in our Forums, Twitter or Facebook.